One of my backup systems uses a Magnum MS-PAE 4024 inverter, which doesn’t have any built-in fan controller. Since batteries give off hydrogen during both normal and equalization charging, it’s important to vent the batteries to the outside with a brushless fan. This little circuit does the job nicely for a 24 volt battery bank. Here’s how the circuit works: Battery voltage comes in and goes directly to the LM358 op-amp and P1-R1. P1 sets the trip point where the fan will turn on. VR1 and R2-R3 provide a stable reference voltage for the op-amp. 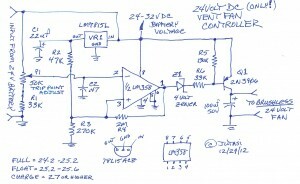 R4 adds some hysteresis so the fan doesn’t cycle on/off when near the trip point. the 4 volt zener assures that Q1 turns fully off, since the output doesn’t swing to the rails. R5-R6 assure that Q1 turns on/off completely. Q1 is good for fans that use up to 100 milliamps of current. 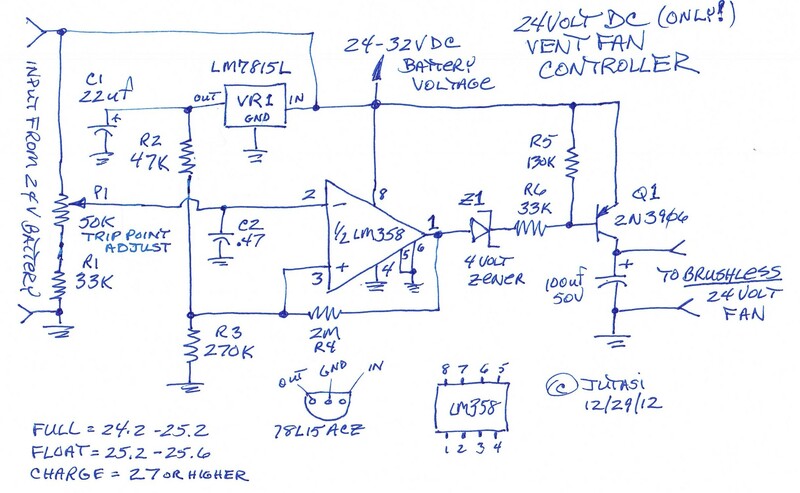 If you have a bigger fan, use Q1 to turn on a relay… This won’t work for 12 volt or 48 volt systems, but I might design those if there’s any interest here…. Enjoy!